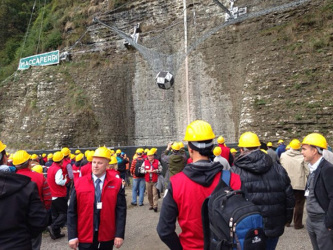 On October 9th, during the second day of the International Rockfall Technical Workshop, Maccaferri carried out a full-scale impact test in the municipality of Fonzaso (BL), Italy. The test was conducted on the RMC 200/A barrier, with a minimum energy absorption capacity of 2,000 kJ (Class 4 according to the ETAG027). The main peculiarity and interest in this specific test was that the kit was composed only of 3 posts and 2 barrier spans (interception structures). It was exposed to a full test to the Maximum Energy Level of 2,000 kJ. The tested kit had the same characteristics of the Maccaferri barrier kit certified according to the ETAG027 but with a reduced length. The impact of the test block was performed on one of the two spans of the kit. Therefore, the impacted span receives a reduced level of assistance, as it has only one adjacent lateral span. The ETAG027 guideline requires 4 posts and 3 barrier spans, with the impact in the central span, where it receives assistance from 2 lateral spans, one on either side of the impact zone. Therefore the test carried out by Maccaferri was more onerous than the ETAG027 Guideline. It provides greater clarity on the performance of Maccaferri barriers when they are impacted in an end span. Rockfall protection and natural hazard mitigation are key elements in the security and safety of road, rail, mining operations and infrastructure networks. Even small rockfalls, debris flows or avalanches can obstruct infrastructure and have far-reaching economic effects beyond the immediate disruption. A deep understanding of these phenomena, their cause and scale is essential in order to design efficient and suitable mitigation measures.